Good tips! One that I would add: Create stress-free mornings by getting ready the night before. I agree, I have done that all my life and made my children it too. So when we got up it was dress, breakfast and ready to go. It is amazing how getting out the door in the morning stress free sets the tone for the whole day. These are all so good, it was hard to come up with one of my own, but here goes: Don’t put off organizing because you don’t think you have time. Pick something small, such as a single drawer or shelf. If you have time, do another one. If not, you’re still one step ahead of where you were! Great advise. Organzing is a process and starts with small steps and grows into a habit over time. I’m a big fan of Nathalie’s tip to go vertical! You really maximize storage space when you go up. I am too. I think about 70% of my clients will hear that suggestion from me to use the vertical space in their home. Great tips Julie! 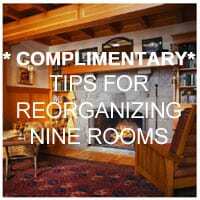 It’s neat that even with so many different professional organizers everyone gave different tips. Just shows that everyone is different and what works one time or for one person, might not be the advice that works another time or for someone else. What a great comment Hilda. I used everyone who submitted a comment because there were no duplicate ideas. Professional Organizing is about finding the Professional Organizer who has the right style, understanding and personality to meet the client’s needs. Great list, Julie! I like to say to myself and to my clients “focus & finish” because clutter is unfinished projects & chores–be that unsorted mail, unread magazines, unfolded laundry, unwashed dishes, or half-finished craft projects. I like doing all my ironing once a week & putting the ironing board away rather than look at it every day. Thanks for posting to POBC. I really like your tip focus and finish. Sometimes getting people to do last small bit is difficult because everything looks and functions so much better than before. If they did the last little bit I think they would find maintaining their systems would be much easier.